We are a non profit and we survive off of donation. we have a paypal standard and pro but unsure of how to make it happen. it appears that only 1 API can be used at a time. It's either single donation or subscription. Is what I am trying to do even possible? Yes, unfortunately, currently, its one or the other. I know the developers are working on adding extra functionality to the payment tools to give our users more flexibility when creating shopping or donation carts. However, Its hard to say exactly when that functionality will be added. 2. You could actually use 2 different forms for your donation options. And either use another form or code it on your website so that when the user selects which type of donation he wishes to make, the correct form is shown. Is that the sort of thing you are looking for? If using 2 seperate forms for your donations isnt an issue for you, it may well be a good workaround for you. 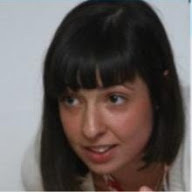 It is a little more involved than creating standard forms, (even if it is remains relatively straightforward), so I have held of explaining how to do it. Just let me know if its something you think you may pursue and I will provide you with a guide on how to do it. OK. To do this, you need to create 3 seperate forms. I will start with the two different payment option forms. Create a form for each style of payment. For this form, I need to retrieve the script embed code. From the Setup & Embed toolbar, Click Embed Form, then click the Embed icon. Copy that code and keep it somewhere safe. Then create a 2nd form, with the subscription payment options. Now grab the embed code like you did for the first form. Finally I create another new form, which is going to hold these two forms. First I create my options using the Radio Option feild. Once that is done, add 2 Free Text (HTML) fields to your form. To each of these , Click the Edit HTML button on the right hand side and paste the script code you retrieved earlier. Click Complete and go onto the next one. NOTE: Its important to remember what forms embed code you put into each Free Text (HTML) field. You just need to remember the order they are in, e.g my 'One time donation' embed code is in the top one. NOTE: When you have these Free Text (HTML) fields populated, i.e clicked on the Complete button. Try not not edit their contents. If you need to make a change, delete the entire field and start over. Now to set up our conditions. From the Setup & Embed toolbar, Click the Conditions button. Ensure ' Show / Hide a form field ' is selected and Click Next. Save the Condition , Click the Add New Condition button on the next screen and create a similar conditon for your other payment option. Click Save to save the condition. Close the Conditions Wizard when done. Now We have one last thing to do, remove the Submit button as we never want this particular form to be submitted. Save your form and inspect the results in a web browser. Now I do realise this is a little complicated, but once you sit down to do it and are willing to perservere a little, you should be able to get something close to the result you want. I hope that helps and I am more than happy to answer any questions. I do have one other question. I have PayPal standard and pro, how do I add “Other” to a list of PayPal subscription. I believe the only time “Other “ is available is when “option” and “checkboxes” are used. Unfortunately, I dont believe there is an 'other' option where users can enter amounts of their own choosing in either standard or pro paypal. the 9.99 Premium plan. Do you have discounts for non-profit organizations like others, as a non-profit discounts. If you would be kind to give us a discount, we would signup for the professinal plan instead. Thank you for much and hope to hear from you soon. Herve, we would appreciate if you could open a new thread for the new request. I am not sure if we do offer a discount for non-profit entities, but upon opening of a new thread we can pass on the request for JotForm management to consider. Yes, putting script tags into Free Text (HTML) fields can be a little buggy. Paste the script tag into the field, as I have outlined above, and once its in, dont edit that field again. If you have to make a change delete the entire field and start over, i.e add the Free Text (HTML) field and paste in the embed code. NOTE: The form you have added this way wont be viewable in the Form Editor, but you can inspect the result by previewing the form. 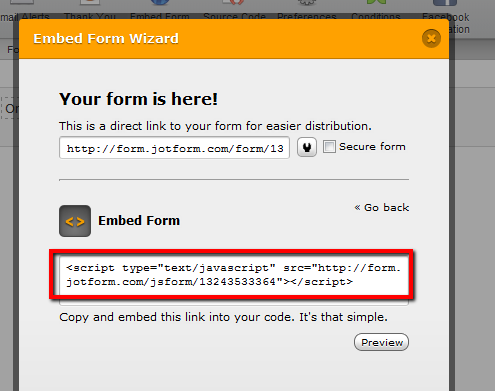 The key is to paste your script embed code into the Free Text (HTML) field, click Complete , then leave the field alone. Let us know if you have any other questions, and please, if at all possible, let us see your finished form. hi again and thanks for the reply. script. However, as soon as I click on complete.... the script goes away. but not inside the html text box. hmmm!!! What am I doing wrong? Once you have pasted that embed code in there, and clicked complete. Its in there, your are not going to get any acknowledgement that its there until you actually preview the form, i.e it will not be viewable in the form editor. Click the Preview button after you have clicked the Complete button and you should see the 2nd form in place. Yahoo! I wasn't doing anything wrong. It works just fine in Firefox. Is the above method (embed script into Free Text) still possible? I tried to do it with my forms and it doesn't work. The script goes missing after I update it. I've done it before but somehow it doesn't work anymore. What could be wrong? Hello tomchen. Yes, it still works. You should add it by clicking the edit HTML button on the form element, exactly how fxr did on his instruction. If you added the code from the tool bar, it won't work. thanks for your reply. What do you mean by "added the code from the tool bar"
I tried it several times but I'm not sure why I keep coming up blank. Do I add it in to the WYSIWYG editor or the actual html? So what you should do is insert your embed code while in WYSIWYG editor format. I created the 3 forms following the directions above. When I preview the form, I see the 2 radio buttons for just a couple of seconds and then they disappear. Any idea why this is happening and how to fix it? Hello Sandie. Can you please share a bit information about your forms so that we can guide you better? 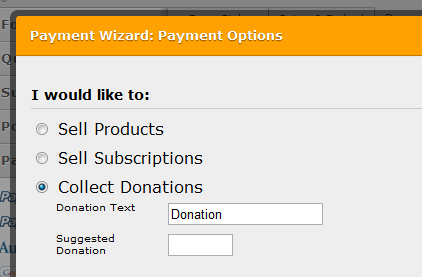 I noticed 3 forms but I'm not sure which one of them is the main donation form and which one should be the payment form fields (as I could not find any condition in any of the forms). If you're a bit hesitant to share the details on this thread, please do start a new topic question and just copy the link from this thread for reference. Your form's conditions work great on my end. Please try clearing your browser's cache. Afterwards, restart your browser, then test your form. If the problem still persists, kindly open a separate thread for it so we can assist you better. I have some issue adding multiple choice in my donation form. I can't get it to work following carrefully the step by step process. Since this tread is quite old, can someone confirm that it's still working. I'm tryng to achieve this with stripe as well maybe it's the issue ? nd single donation. Images are not visible. This is an old thread, from 2011. I have moved your question to separate thread and we will provide you an answer there shortly.